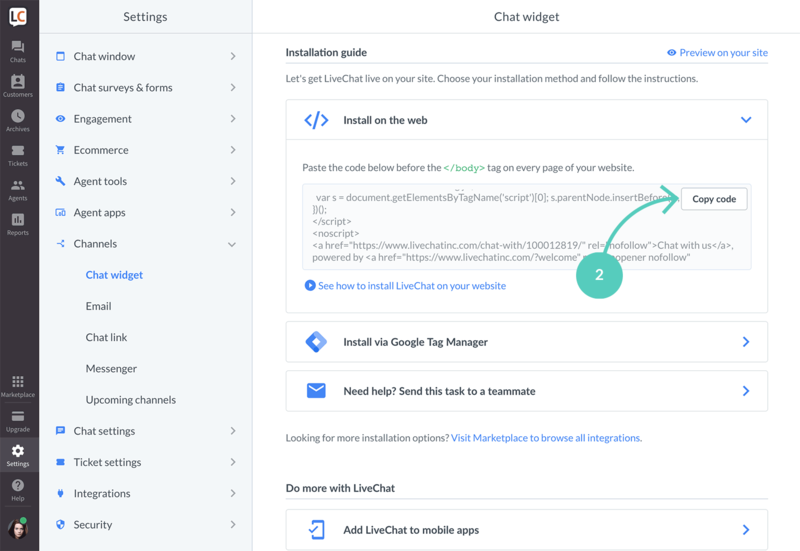 Installing LiveChat is simple and only takes a few minutes. Once installed, you’ll be able to talk to your customer’s right away. 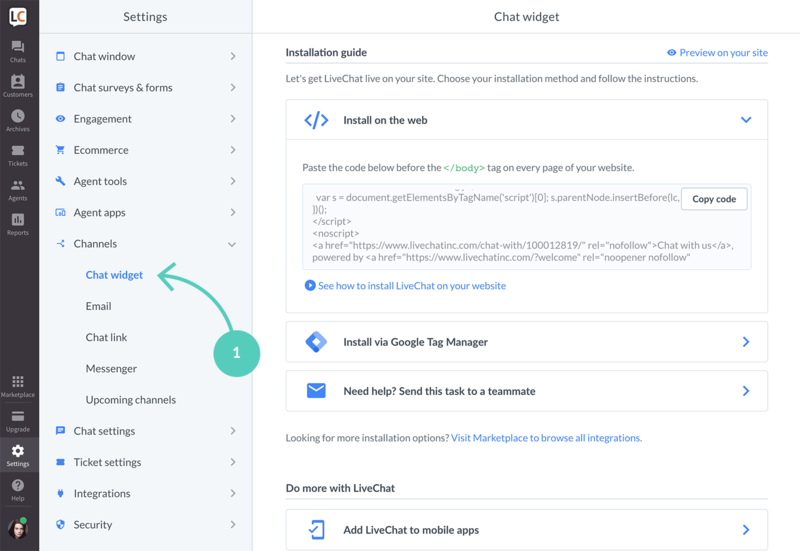 Install LiveChat using integrations—check out the list of platforms that LiveChat integrates with. 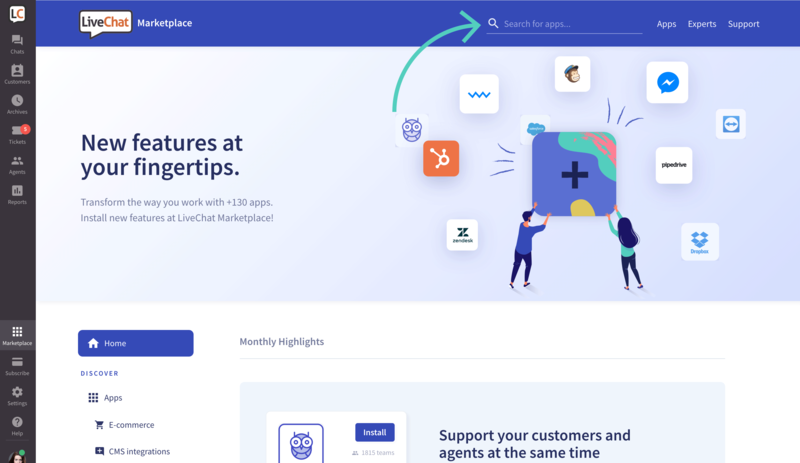 What’s next—first steps after adding LiveChat to your site. Log in to your LiveChat account and go to Settings → Channels → Chat widget. Then, click on Copy code. Paste the code to your website’s source code before the </body> tag. Once you’ve successfully added LiveChat code to your website, refresh the page. You should see a chat widget in the bottom right corner. Have any issues with the installation? Our Support Heroes can help (and are available 24/7). Running your website on platforms like WordPress, Shopify or Bigcommerce? We’ve got you covered! Not what you are looking for? Visit Marketplace to see more 3rd party integrations. Once you are there, use the search bar to find the web host you’re using. All integrations come with a step-by-step tutorial, which you can also access from Marketplace. 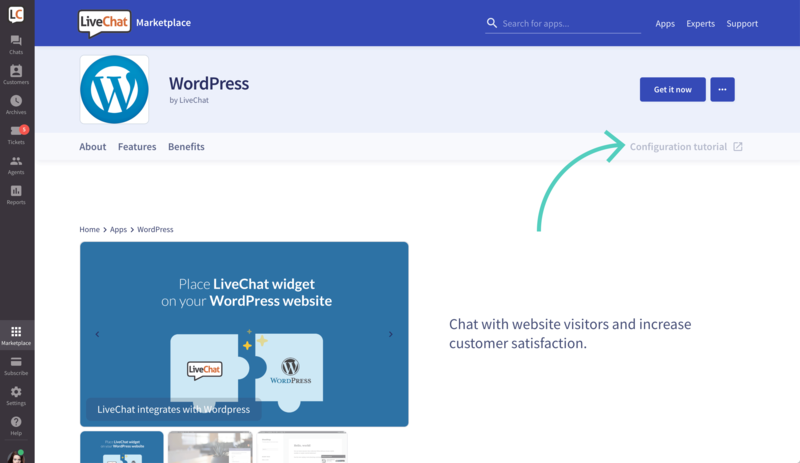 Customize the chat widget—so it matches your site’s design. Read more about our easy to use chat widget configurator. Play around with greetings—increase the number of incoming chats by setting automatic invites (we call them greetings). Watch a product tour—learn the ins and outs of LiveChat from people who use it every day. Watch a product tour video. Read our handbook—check out Agent’s Handbook that quickly explains essential LiveChat features.